I’m not really sure what inspired that last post? I wanted to write something and that’s what came out. I think I was trying to be reflective in some way. Not really informative in any way, so sorry. More like I spewed some random thoughts out of the blue, just to have an excuse for a post. However, it also acted to precede this post. The promised lunch date. As lunch dates go they usually are not long, but they are informative and a good excuse to leave work (Ok, I don’t work per se). 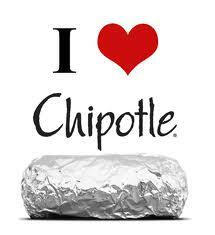 Anyway, I miss Chipotle, so that’s going to be where we eat. Not romantic, I know. There is a serious lack of good Mexican food here, or at least I just haven’t looked hard enough. Lot’s of Indian food and Curry though, if that interests you. So, aside from my lack of eating Mexican food, what have I been doing? Much of the same; football (soccer), training, searching, learning and some touristing (I know that’s not a word). Because this is a short lunch date, I won’t tell you about the learning and touristing today…which is good, because that means we’ll have to have another date soon. Obviously I want to be playing in games, but since I haven’t been doing much of that, I have been going to quite a few. I’ve gone to a game at Huddersfield Town and 2 games at the local side Guiseley AFC. Spending time, and money, going to games is like homework…well, maybe more like a field trip. Either way its fun and educational on a number of levels. I personally enjoy going to games to experience all the different flavors that English football has to offer. This entails the crowd (cheering and jeering), the stadium, the town, and even the walk from the train to the field. It is also good for me to see the different levels of play between different divisions, as well as varying styles. 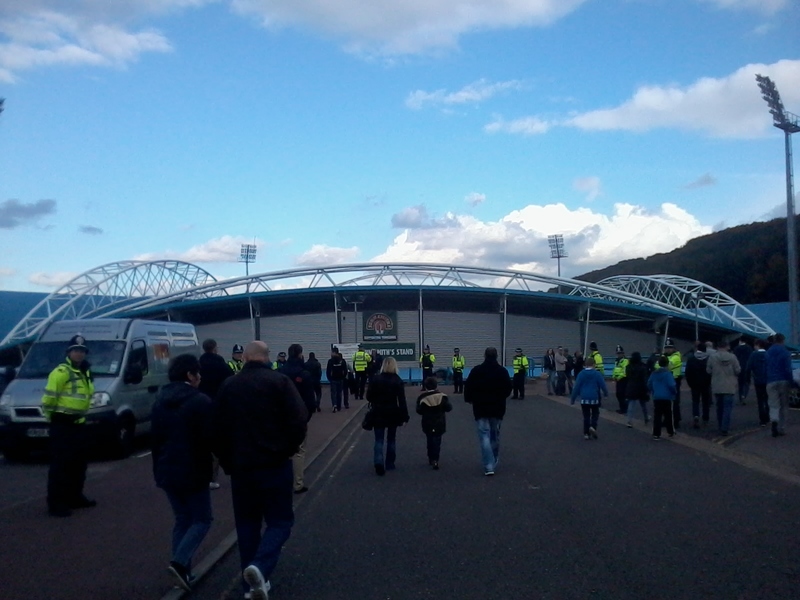 The Huddersfield game was a few weeks ago. It was about an hours train ride to see the Championship (2nd division) side play. On the day, the home side were the better team and the result reflected that as they came out 2-1 winners over the recently relegated premier league side Wolverhampton Wanderers. 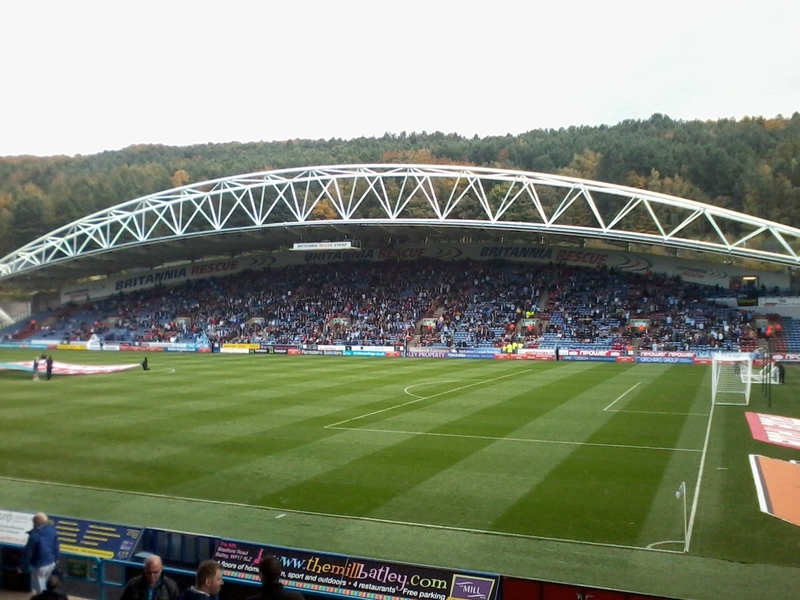 The crowd at the Burrito Bowl…that is the John Smith Stadium (aka Galpharm Stadium) was rowdy, the traveling fans, who I ended up quite near, were also in full voice, and 2 great first half goals from Huddersfield made for an enjoyable afternoon. 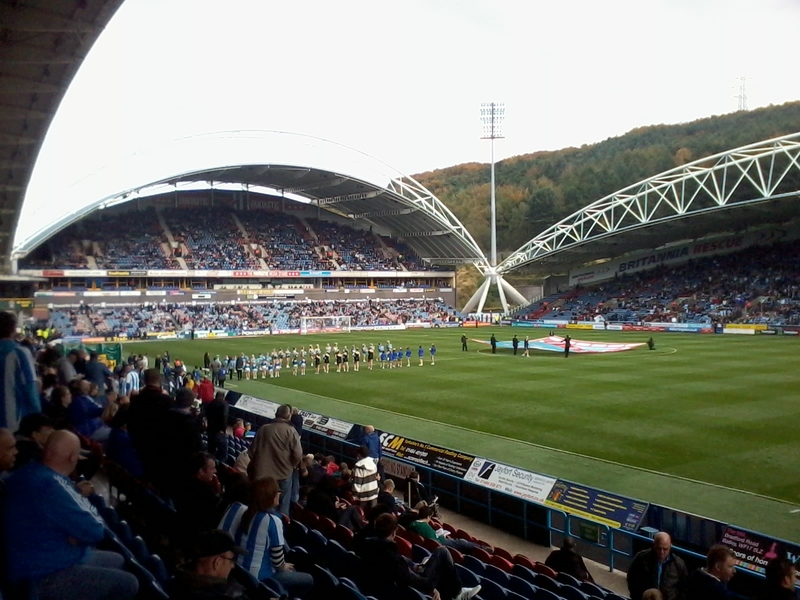 Both of Huddersfield’s goals came off of well executed crosses from the right hand side (right in front of me). The first was headed in and the 2nd was a lovely one-time side volley from Jermaine Beckford (famous for scoring this lone goal against Man Utd while playing with Leeds a few years ago to knock the Red Devils out of the FA Cup). A late bit of pressure from Wolves saw them nick a goal towards the end, but overall I thought Huddersfield were deserved victors. One of the newer looking stadiums I’ve been too. The atmosphere was great. It started with the walk in, where a few hundred Wolves fans were being ushered in by local police; complete with horses and all. The away fans were just to my right throughout the game and were fantastic. A few of them; however, seemed more set on instigating the fans around me and had some success. They were plenty of taunts and obscene gestures being thrown back and forth and more than 1 person from both parties would have been happy to “take it outside” so to speak. Due to the large presence of police, I doubt this occurred, but in a slightly twisted, testosterone induced sort of way hope it did. 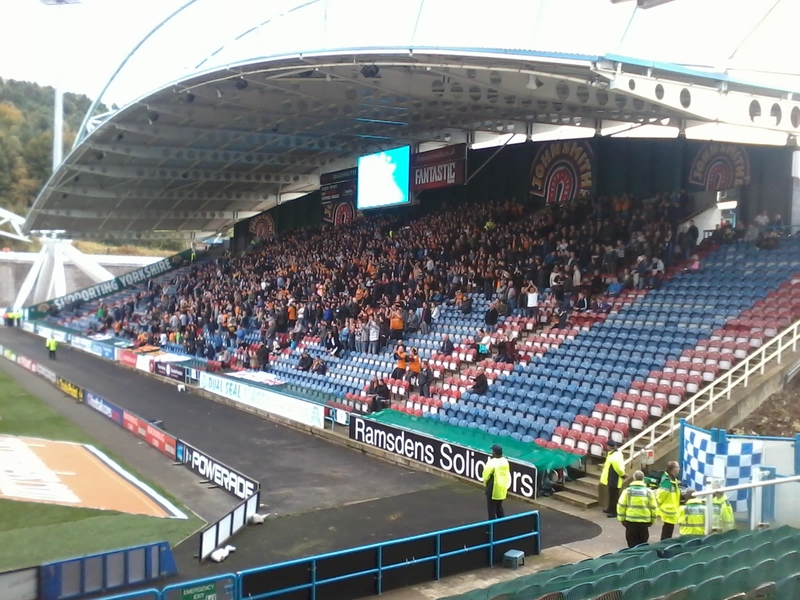 The away stand filling up with Wolves fans in their orange kits. I have now been to 3 games at Guiseley AFC. The first one I already wrote about in a previous post and I will briefly tell you about the other two. The 2nd one was a Tuesday night game vs local Bradford rival Bradford Park Avenue (BPA) in none other than the West Riding County Cup (If you don’t remember, the WRCC was the cup that I was involved in and wrote about a while back). Also, coincidentally – or not considering it is why I went to the game – BPA is the team that I have trained with a few times. Unfortunately, BPA, who I was obliged to root for, got…well there’s not a nice way to say it. The final score was 4-1 to Guiseley. The game was essentially decided in the first 10 minutes, when Guiseley scored 3 quick goals – and it could have been more. They added one more at half before BPA got a consolation goal late on. From what I have observed of both teams, it appeared both of them started “weak” teams, which shows this cup is not a big focus for them. After making a few changes though, BPA settled in and had a presentable second half. However, after the initial burst of goals from Guiseley, the final result was never in question. The second game was an FA CUP 1st round game vs Barrow Town (1 division above Guiseley-5th division overall). Guiseley is a favorite for promotion up to this league and will have to face this kind of competition on a weekly basis if they can make the jump this year. As opposed to the WRCC, the FA Cup is a big, BIG deal for smaller sides. Not only are their huge financial benefits for the teams (from what I hear making the 1st round alone = 60,000-80,000 pounds), it also provides an avenue (if they progress) for smaller teams to play the big premiership teams like Manchester United, Arsenal, or Liverpool. The game ended in a 2-2 tie. This means that there will be a replay next week at Barrow Town. If their is no winner in this game, they will go to overtime and penalties if needed. Guiseley will be frustrated having to travel to Barrow after dropping an early 2-0 lead. As they say, I know it’s cliche, the 2 goal lead is the most dangerous. It doesn’t really make sense, but they say it anyway, and it has an uncanny aspect of truth to it (It’s dangerous because of the mentality it can provoke – for both sides). Anyway, it was a very good game overall, with much more intensity than the WRCC game. The small ground, Nethermoor Park, was packed – standing room only – and the away fans were in full force. Yes, I continue to train on my own. The details are boring, but I feel good about my fitness, though it is hard to judge. I continue to search for opportunities. I have been adopting a more direct strategy than before, trying to go and intercept managers at training instead of going through phone calls and offices, where they seem to have a endless supply of lines to feed me when I ask to speak with the manager for a trial. The trouble of course is finding out where training is. I watched Bradford City train last week and spoke with their manager after, asking to train with them. He said “no” in more words, essentially saying that I need to be playing somewhere and they can scout me. Frustrating, but fair considering they get these requests daily. The day after that, Bradford City beat Wigan (a Premier League side) in the League Cup and will play Arsenal (BIG DEAL) in the next round…I’m taking some credit as a good luck charm at least. I spent a day in the Manchester area as well, doing my thing – with some 5th and 6th tier sides – and am waiting to see if that bears any fruit. Nagging, nagging, nagging, and if they want it to stop, I can recommend a remedy. I won’t go away, I’ll go head-first.